To continue the discussion on fan fiction versus copyright, here follows the case of the two “Alephs”, one by Jorge Luis Borges and the other by Pablo Katchadjian. 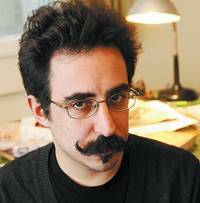 In Buenos Aires, Argentina, writer Pablo Katchadjian is currently being sued for plagiarism, or the re-use without permission of copyrighted work, because he “fattened”, padded, added to or otherwise re-used the novel The Aleph, written in 1945, by the famous Argentine writer Jorge Luis Borges. Katchadjian says, in his defence, that his version of the novel, called The Fattened Aleph, is a “lengthened” version of Borges’s short story and is not plagiarism because it is “an experiment” and “open about its source”. An open-and-shut case this is not. The Fattened Aleph, originally El Aleph Engordado, by Pablo Katchadjian. The Aleph, by Jose Luis Borges, in his collection of short stories. In 2011 Borges’s 79-year-old widow, María Kodama, began the process of suing Katchadjian for “intellectual property fraud” since The Fattened Aleph is simply the original short story extended from its original 4,000 words to 9,600 words, and Katchadjian did not ask her permission before he published his version. So it was indeed “fattened”. The case is about to go to court in February 2017. Copyright on The Aleph would only have expired in 2056, 70 years after Borges’ death. The Fattened Aleph was published by Imprenta Argentina de Poesía. That being the case, adding in more words and more descriptions, like Katchadjian did, would be the antithesis of Borges’ style and would probably not work as well – but as Katchadjian said, it was an experiment. The defence claims the work is not a forgery because it is a “new work”, open to its source, and an experiment, and “only Katchadjian’s name appears on the cover. It doesn’t say; “The Aleph by Borges, altered by Katchadjian” anywhere in the book. This is similar to instances when a modern painting that looks like a Renoir, for instance, does not carry Renoir’s fake signature or say on the back “made by Renoir”, in which case it cannot be called a forgery. Either way, it seems that while Katchadjian broke the letter of the law, he did not intend to infringe the spirit of the law. As the widow had said, he should’ve asked permission, but that is not enough reason to throw him in jail for five years. The case has caused María Kodama to be called a “copyright troll” who is “overly litigious”. Industry expectations are that Katchadjian will not be found guilty. THE USE OF ORIGINAL IMAGES ON THIS WEBSITE: The header for this and other posts contain images from both original and fan fiction/sequels by other authors. In this case, Tintin and Snowy (left) come from Rodier’s version, the Little Prince (adapted, centre) comes from the copyrighted original by De Saint-Exupéry, and the Young Prince (right) comes from the copyrighted A.G. Roemmers’ version. All three images have been used under the terms of “fair use”: “In its most general sense, a fair use is any copying of copyrighted material done for a limited and ‘transformative’ purpose, such as to comment upon, criticize, or parody a copyrighted work.” (Rich Stim, Stanford University Libraries). The main image, of Paris, France, is by M.F. O’Brien, used with permission. In other words, no copyrights have been breached here. Three books of poetry: el cam del alch (IAP), dp canta el alma (Vox) and in collaboration with Marcelo Galindo and Santiago Pintabona, and los albañiles (IAP). His work has been translated into English, French, and Hebrew, and La libertad total was adapted as an opera and staged at the Teatro San Martín in 2014. In 2009, he published a rewording of Martín Fierro, an epic 19th-century poem about gauchos, which he called El Martín Fierro ordenado alfabéticamente (published by IAP). So even back then, he created a pastiche of a famous work.